I can't figure this card out. Is it as terrible as it seems? I mean, half of the pay-off is just spent replacing Hamu itself. My guess is the game designers remember Ancestral Recall from the old Magic: the Gathering days, so they didn't want to make the same mistake. But has anyone found a use for this card? If so, I'd be really curious to hear about it. 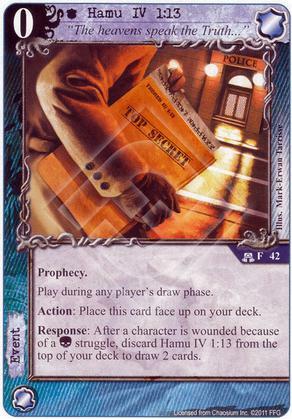 I can only see using it in a deck that has some Prophecy-leveraging cards like Apocalyptic Visions (so that you didn't use a draw to get the Prophecy), Atlantis (so you get yet another draw), or Eschatologist (to give the card an alternate use of cancelling a triggered effect). Prophecies are pretty weak, on the whole. It replaces itself and gives you another card (upon the proper condition being met--an easy one if you're playing Agency). Effectively your deck is one card smaller and you draw a card, so you're more likely to see something else you're looking for. But yeah, it is better still to find other uses for it. The Greatest Fear... for example.